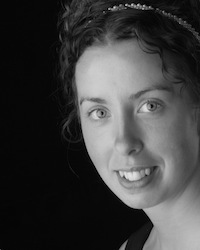 From Lauren: Please meet Kari from GI 365. I always drool over Kari’s beautiful photography and uber-creative grain free recipes. 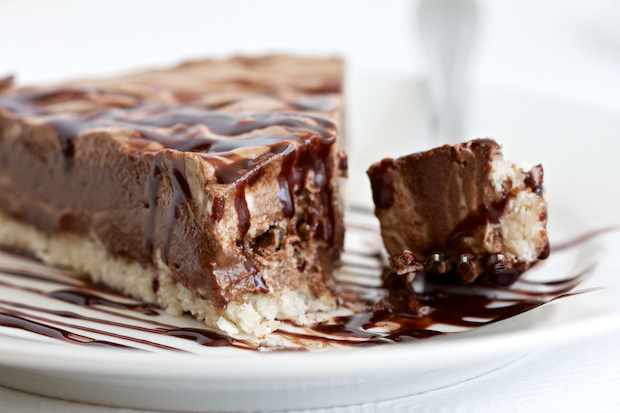 Today she is sharing this gorgeous Chocolate Coconut Pie, which you can serve chilled or frozen. 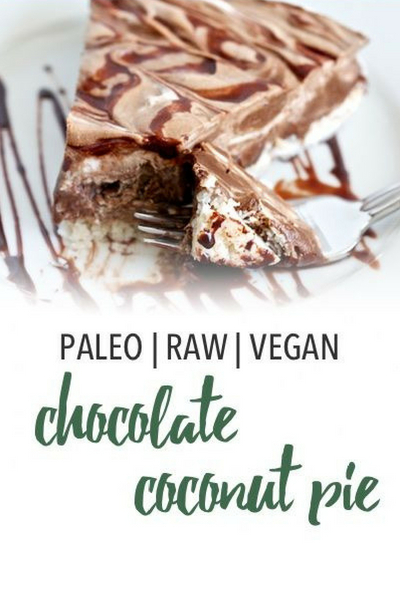 This chocolate coconut pie is so creamy and delicious, I just can’t get enough of it! 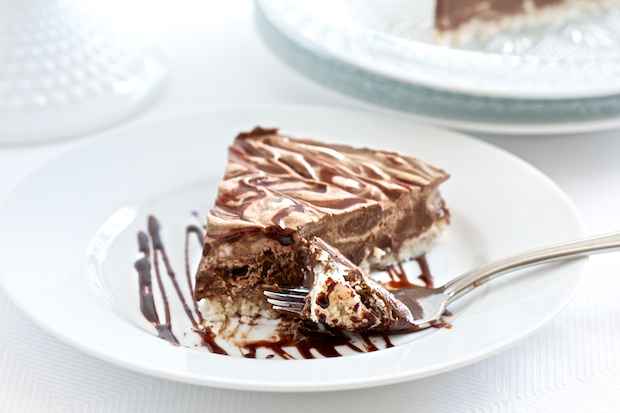 It’s rich and chocolatey with added creamy lightness from the coconut whipped cream. It’s the perfect ‘no bake’ dessert for these hot summer days. 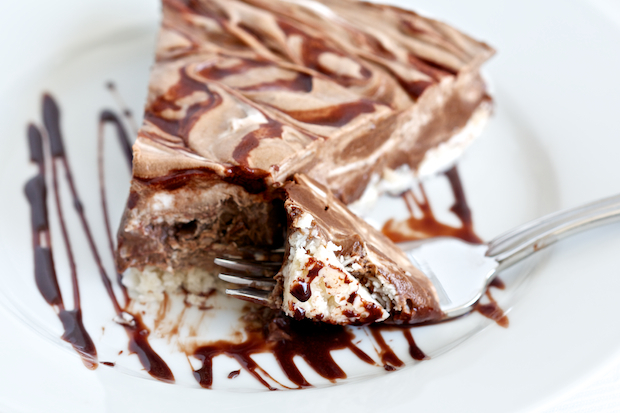 It can also be frozen like an ice cream pie, (let it stand at room temperature 10-15 minutes before slicing). This pie is also completely nut free! Since I started eating whole foods, I’ve relied on nuts to make most of my crusts, but I’ve found that coconut makes a great alternative. It’s sticky, slightly chewy, and oh so… good! I’ve always had a weakness for decadent desserts, and this one definitely satisfies the deepest darkest chocolate cravings. Hope you enjoy this summer treat, and thanks to Lauren for letting me guest post today! In a food processor, combine the ingredients for the crust and pulse until a 'dough' begins to form. Press the crust into a parchment lined springform pan. Clean the bowl and place it back on the base. 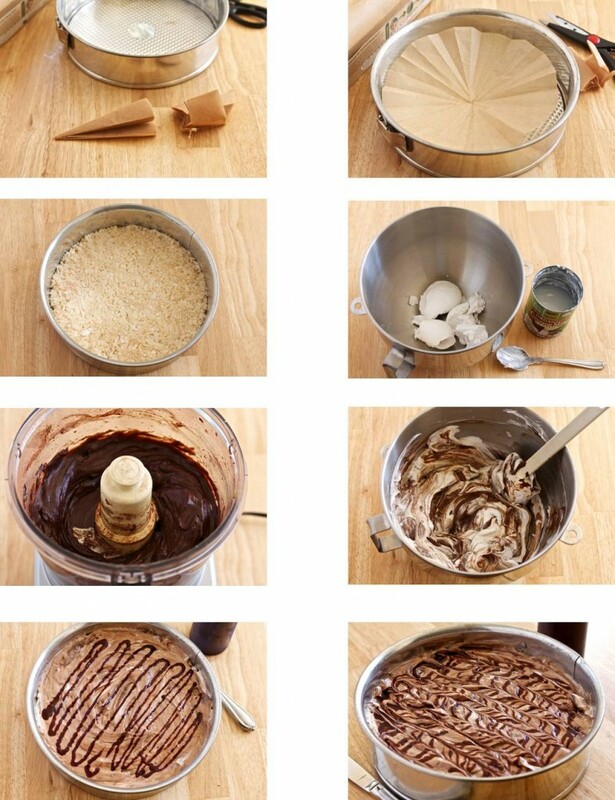 Place all the ingredients for the chocolate mousse in the food processor and process until smooth. Set aside. Scoop the solid coconut cream off the top of the can (leave the watery liquid in the can, it is not needed) and whip on high until light and fluffy, about 10 minutes. Carefully fold the chocolate mousse and coconut whipped cream together, leaving the mixture swirled. Scrape the filling onto the crust. For the Fudge Sauce: mix together ¼ cup Grade A maple syrup and 2 Tablespoons cocoa powder until smooth. I keep mine in a squeeze bottle for easy drizzling. Double the fudge sauce to have extra on the side. Drizzle fudge sauce over the top. Run a knife through the fudge sauce to create swirls. Cover and refrigerate or freeze for at least 3-4 hours. Note: You can also make this in a pie plate, but it will be more difficult to get the pieces out for serving. Hi everyone! My name is Kari from GI 365. I’m enjoying country living here in the Flathead Valley, Montana. I love to create simple healthy recipes, and occasionaly a chocolatey indulgence. I’m learning to incorporate more fresh fruits and vegetables into my everyday diet to maintain better health and a higher energy level. Additionally, I post about traveling and hiking adventures in the mountains and a lifestyle section where you can find ideas for a non-toxic approach to everyday living. I hope you find something inspirational, and be sure to let me know what you think! Visit GI 365 on Facebook, Twitter, Pinterest and Google +. Wow, this looks so good! Do you think it’s possible to substitute the avocado for 2 additional cans of coconut milk? My coconut milk did not whip up. I chilled the can in the fridge for 24 hours. what else can I do? Very disappointed. THANK YOU THANK YOU THANK YOU, for a gorgeous SIMPLE recipe WITHOUT NUTS for a holiday treat! I’m making this for Thanksgiving! I was wondering if this would last for a 30 minute car ride in approximately 40 degrees F weather. Thanks Kari…as soon as I saw this recipe, I knew you were “the real deal”. It’s challenging to find someone who really knows how to make gluten-free dairy-free that tastes good. Can’t wait to try it (licking lips). I made this for Easter. It was super rich and chocolaty. So good, thanks for the recipe! It was good, but the cocoa is a little overpowering. I’m a dark chocolate lover, but sometimes paleo recipes go overboard with this ingredient. I would reduce it by 25% if I make this pie again. Please give an amount (in cups or Tablespoons, etc.) for the avocados as they can vary dramatically in size and impact the ratio of remaining ingredients. Thanks! This was a guest post, but I’ve made the recipe successfully using what I would call “medium-sized” avocados. The definition of “a medium size avocado” according to Google is 180 grams. The recipe has some wiggle room with the avocado size. I hope that helps! I am confused with list of ingredients for chocolate mousse. Are the coconut milk and coconut oil what goes into the coconut whipped cream? Or is it part of the mousse?